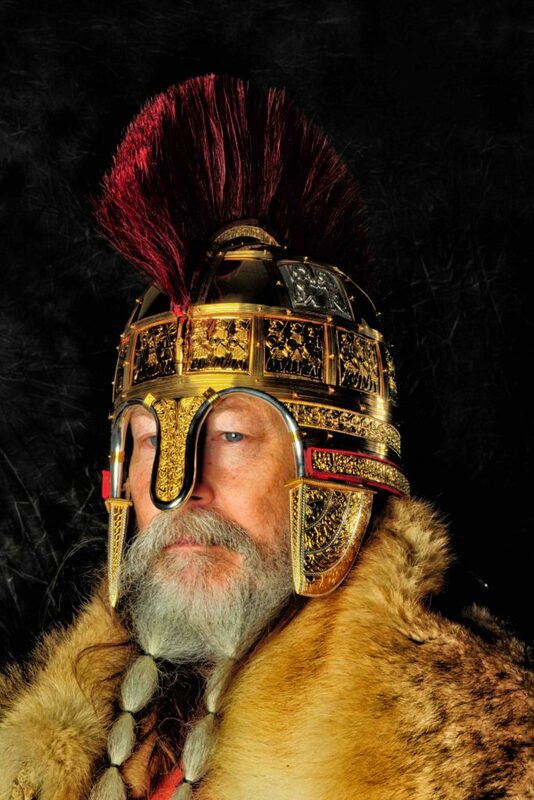 All of us at Drakon have been involved with the Staffordshire Hoard Anglo-Saxon collection for the past few years on-and-off: it’s how we all met in fact. Pieta and Lizzie both worked on the conservation project for Birmingham Museums Trust, and Jenni was the programme coordinator for the two museums that care for it, Birmingham Museum & Art Gallery and the Potteries Museum & Art Gallery, Stoke-on-Trent. 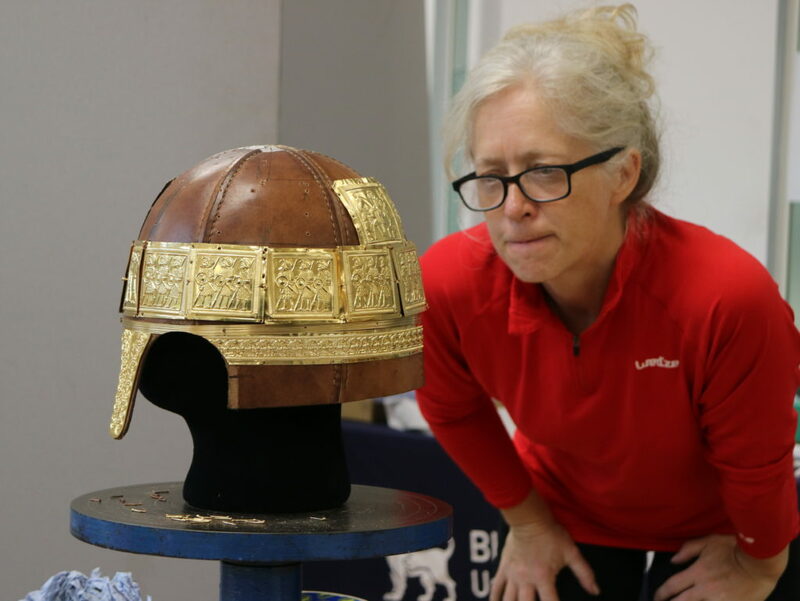 It seemed fairly clear from early on that there were parts of a helmet within the thousands of gold and silver Staffordshire Hoard objects and fragments. As well as cheekpieces and a channel that’s the foundation for a crest, the research project (funded by the museums and Historic England) dedicated considerable resources to identifying, sorting and reconstructing the large quantity of stamped silver sheet that made up the decoration. Towards the end of the research project, the museums decided to commission an experimental reconstruction (two identical ones in fact, one each) of the helmet. 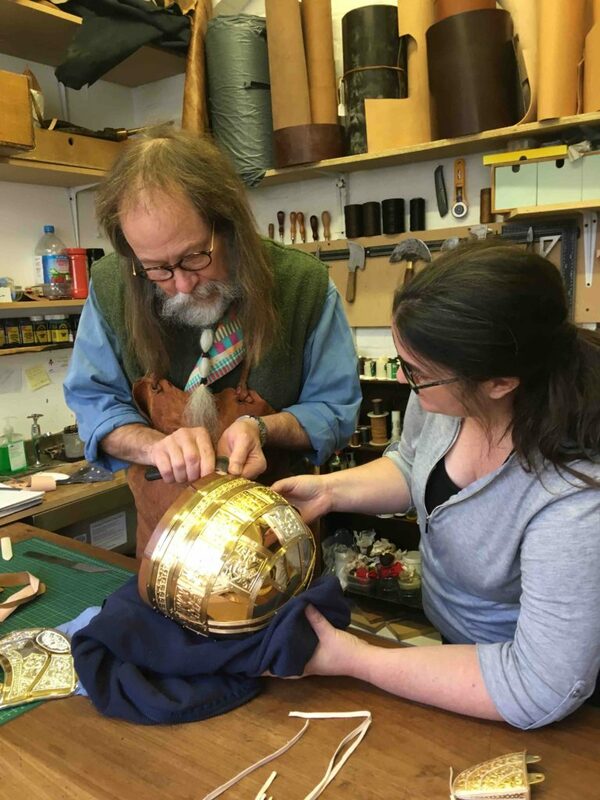 Despite the extraordinary research work on the helmet led by Chris Fern and George Speake, there were alot of questions still to answer about the potential manufacture of the helmet, and how it worked as a 3D object. 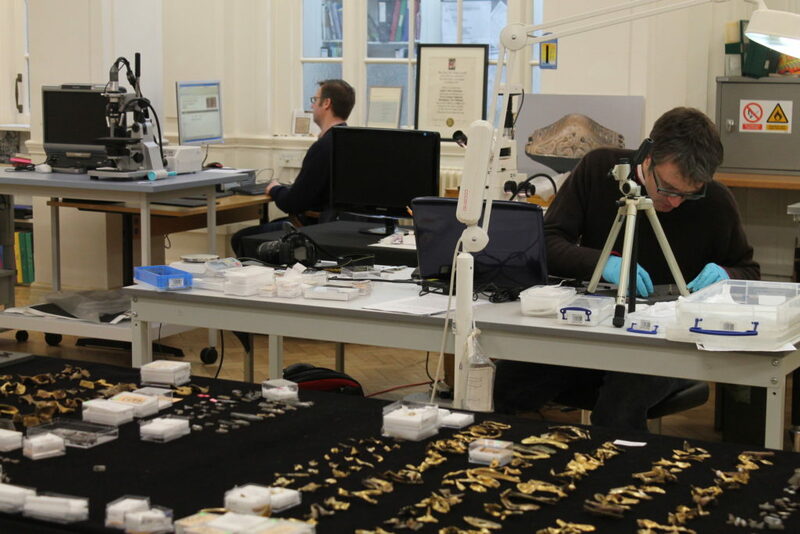 Also, the reconstruction would help with the interpretation of the collection. Essentially, the Staffordshire Hoard is an amazing group of beautiful fragments: understanding the complete objects they derive from requires quite a leap of understanding that replicas and reconstructions can really help with. In the case of the helmet, the original parts are too fragmented and damaged to ever be reconstructed. The team was large- we at Drakon led on the project for the museums, Birmingham City University School of Jewellery recreated the precious metal elements (using modern technology to ensure close relationship with the original material), Mark Routledge (Gallybagger Leather) created the leather, Jeffrey Hildebrandt (Royal Oak Armoury) forged the steels, and metalsmith Samantha Chilton assembled the helmet, assisted by Pieta. The project took about 18 months altogether. Pieta was responsible for creating the organic components of the helmet, and we think these are possibly the most interesting- and controversial- parts. The scientific analysis has shown there’s extensive use of beeswax, animal glues and other pastes throughout the collection, including in the helmet brow band and crest channel, so Pieta used these as a guide for the assembly. The incredible horsehair crest is a choice, informed by George and Chris’s research- we know the channel was designed to hold some form of crest, but not exactly what- and we will be interested to see what people think about it.